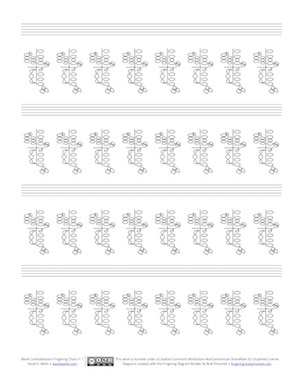 This is a ver­sion of my print­able blank fin­ger­ing chart for con­tra­bas­soon. Con­tra­bas­soon key work is far from stan­dard­ized, so it was hard to pick exact­ly what to include. I end­ed up emu­lat­ing the Fox con­tra­bas­soon owned by my school, which I think is fair­ly mid­dle-of-the-road in terms of key work. The actu­al fin­ger­ing dia­gram here is based on one from Bret Pimentel’s Fin­ger­ing Dia­gram Builder.